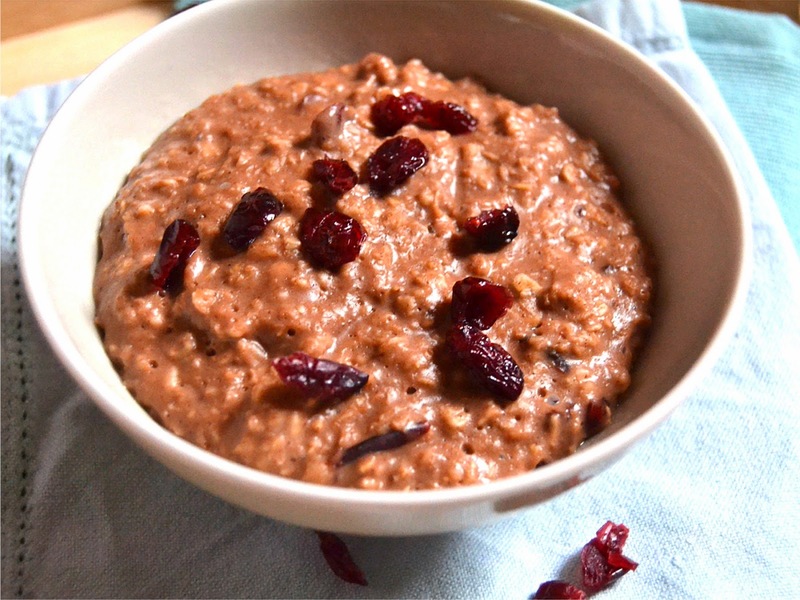 Another breakfast recipe for you, although this Chocolate, Cinnamon and Cranberry Porridge is just a wee bit healthier than the Elvis MacMuffin breakfast sandwich I brought you recently. In fact this porridge, triple C porridge I am going to call it, hits the sweet spot, but has mostly natural ingredients. I love porridge. I could eat it every day of the week if I had time. Sadly I only eat it on weekends when work isn’t beckoning. I know I could use instant porridge options, but they don’t quite do it for me. I use almond milk in mine and drizzle with some light pancake syrup. This triple C variety though is even better than that. It’s sweet, spicy with the cinnamon and a bit tangy from the dried cranberries. Make sure to use unsweetened cocoa powder (or cacao if you have it). It’s not exactly re-inventing the wheel but when I thought of adding cocoa to porridge I realised what a treat it would be. Place the oats in a saucepan and cover with the milk. Add the cocoa and cinnamon and a handful of cranberries. Cook over a low heat, stirring continuously, until the porridge begins to boil. Let it simmer for a minute or two until it thickens. Transfer to the serving bowls and scatter with some more dried cranberries. It’s simple and delicious – and healthy! A great way to start your day. Another great idea! Like you, I don't have time to have proper porridge as often as I'd like to... Maybe this weekend! Choccy porridge is the way forward Fanny! I better not tell Cooper about this or he'll never want normal porridge again. Dangerous! However I think it looks great! Not too dangerous Jac - if you use raw cacao powder! I used to eat Ready Brek ALL the time when I was younger Sarah. Strangely I didn't like the chocolate variety. Now this is what I call breakfast. Love it. Will try with my kiddoes. I think this looks absolutely delicious! I don't make porridge all that often, but when I do I am reminded that I should make it more often... Do you use a 'spurtle' to stir, seeing as you're scottish ?! My mum actually has a spurtle! Me? I use a good old wooden spoon!! This could be the one that converts me to porridge! Looks amazing and the flavour combination is a winner! How can you not like porridge?! #shocked! !